The Uruguayan Port of Montevideo finally put its dedicated dry bulk terminal TGM into operation in December. The facility, which specializes in grain, absorbed investment of $100 million. It has a capacity to handle vessels of up to 85,000dwt and expects to attract cargo from the coastal and midwestern regions of the country. The project was implemented by Obrinel SA, whose investors include the Christophersen group and Hidrovias do Brasil. The concession is for 20 years. Construction originally began in January 2014 in the extreme northern region of the port, close to the Colombia access gate. The complex encompasses 12 silos, each of which can handle up to 10,000 tonnes. The terminal’s single berth has alongside draught of 12.5 metres and will allow vessels coming from Nueva Palmira to call there. Both Panamax (65,000 tonnes) and post-Panamax (85,000 tonnes) vessels are expected to use the facilities. 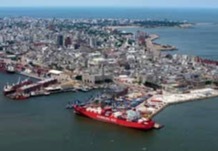 This is only the second private terminal to be built in the port of Montevideo, the previous one having been a container terminal opened in October 2019. According to the National Ports Authority,TGM is expected to handle soya and other grains as well is wood chip.